She is always a delight to visit. She always makes you feel like your health is important to her, and thatyou are able to trust her. Despite difficulties she may be going through, you are her priority when you are with her. Highly recommended. She is always a delight to visit. She always makes you feel like your health is important to her, and that you are able to trust her. Despite difficulties she maybe going through, you are her priority when you are with her. Highly recommended. Dr. Kadir's demeanor was caring, supportive and warm. She wanted to truly understand when the feelings / symptoms startedand how far back they could be traced. She took the time to actively listen, acknowledge my concerns and provide consultative solutions. I even stopped halfway through the appointment to tell her that I've never felt so open and comfortable with a DR. I've already recommended 2 additional patients to see her. Between her knowledge, explanations and ease of comfort, she far exceeded any expectations I had for a DR.
Dr. Kadir's demeanor was caring, supportive and warm. She wanted to truly understand when the feelings / symptoms started and how far back they could be traced. She took the timeto actively listen, acknowledge my concerns and provide consultative solutions. I even stopped halfway through the appointment to tell her that I've never felt so open and comfortable with a DR. I've already recommended 2 additional patients to see her. Between her knowledge, explanations and ease of comfort, she far exceeded any expectations I had for a DR.
All PATIENTS: Please enter in your complete insurance information. Unfortunately, we have opted out of Medicare, Medicaid and are not in network with several Obamacare Plans. The best way to verify that we are in network is to call your insurance company. We do our best to verify your benefits before your appointment. If you do not enter in all your information and/or we are unable to verify your benefits, you may be charged in full for your appointment. 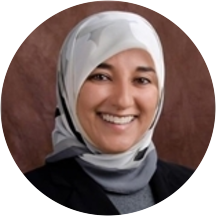 Dr Lamia Kadir is a Board Certified Family Physician. She works with her stellar NP, Athena Newell. We enjoy seeing children/adults above age 3 and practice the full scope of Family Medicine. Dr. Kadir has particular interests in Women’s Health, Basic Dermatology, Preventive Medicine, and Chronic Disease Management (such as Diabetes and Hypertension). We offer onsite ADHD and Allergy testing, please see our website for details. If you are looking for Comprehensive, Compassionate, Convenient Care, feel free to book an appointment with us. She talks WAY to fast and doesn't let you finish your thought before guessing what is wrong. She was incredibly attentive, patient, and caring of the issues I was concerned about. Dr. Kadir listens to you and your concerns and that is the most important thing to me. She explains everything to you and helps so much with anything you’re experiencing. I have been to so many doctors who have not hadthe time to help me understand what I’m going through or how to get better. I’ve had a completely different experience with Dr. Kadir. I want to spare my personal details because this is about how she can help you. I will forever be grateful for her service. Dr. Kadir is fantastic! She’s super easy to talk to and very understanding and compassionate. I’m so glad I found her! She is AMAZING! I have been a long time patient and I have never been disappointed with her. Her practice has been through some changes but I am patient and she is worth it. Wouldn't trust me or my family and friends to anyone else. Dr. Kadir was pleasant, but I didn't see her until an hour after my appointment time (good thing I brought a book). she is truly an amazing caregiver/family doctor. Dr. Kadir is always very thorough and never tries to rush through your appointment. The entire office staff is always very friendly. Dr. Kadir has excellent bedside manner and is very caring, thorough, patient, and informative. Her office staff are very professional and personable as well. I highly recommend her. I think you should have a "Less than 15 minutes" wait timein your last question instead of "Less Than 30 Minutes." Although, my wait time was not "Right Away," I checked that, because it was the closest to about 10 minutes which was the actual wait time. There was a wait since the office was running behind, but everyone was very communicative about it right from check-in. This is my third time seeing Dr. Kadir and I very much appreciate her as a doc. Super knowledgeable and helpful! Dr. Kadir was great - I did have to wait a while to see her, but it was worth it. She's the first doctor that I've seen that wants to help me treat the underlying problems rather than just giving me medicine to treat the symptoms. Excellent Doctor, born to be a doctor! she was very fun, kind, personable, knowledgeable and a really good listener. she really took the time that other doctors have never really taken for me to thoroughly explain medications, explore symptoms and understand potential causesfor whatever issues i had.. and as i NEVER go to the doctor, i had a few things to talk about. she never made me feel like she was rushing, even though she was obviously very busy that day. highly recommended. Dr. Lamia Kadir and her staff were really informative and quick to answer any questions I had, whether it regarded my condition, treatment, or the details of papers that needed signing. Dr. Kadir is really caring, easy to talk to, and treats you like an adult. I love Dr. Kadir! No nonsense, very conversational, and has the answer to everything. Dr. Kadir was very professional, knowledgeable and friendly. I am so pleased that I found her! Dr. Lamia Kadir and Dr. Athena are warm, welcoming practitioners with the best care I've ever received! They're professional and friendly, extremely helpful and I'll patronize their practice as long as possible. Dr. Kadir is the most amazing Dr. I have been loyal to her for years and refer everyone to her. She is very pleasant and very thorough and able to diagnose quick. She is always on point. Fast check in. PA very nice and willing to help. Dr.Kadir is really excellent! She was one of the first doctors I've seen to address my issues/listen to me and get the help I needed. She is always attentive and lovely- highly recommend! she is truly the BEST! she’s funny obv very very smart but also kind and compassionate. she’s probably the best physician i have ever seen in terms of the care she provides. Dr. Kadir is thorough, honest and to the point. Her labs are priced correctly, and she makes time for each patient By far my favorite GP doc I have had do date. Hard to find someone that takes the extra time for you and listens to what you say. Dr Kadir is the best. I like that she explains everything and is very thorough.